Durham’s limited-overs captain Mark Stoneman has turned down a two-year contract extension and has opted to move to Surrey at the end of the season in the hope of realising his dream of playing for England. The highly-rated opener led Durham to the Royal London One-Day Cup in 2014 and accrued more than 1,000 runs in their County Championship success the preceding year. Indeed, he has notably passed 1,000 Division One runs in each of the last three seasons and – although he is yet to receive international recognition – he was name-checked by England head coach Trevor Bayliss recently. In an effort to further his England ambitions, Stoneman has decided his future lies away from Chester-le-Street and he will once again link up with Michael Di Venuto, a former Durham team-mate and now Surrey’s coach. The 29-year-old said on Surrey’s official website: “Joining Surrey under the guidance of long time mentor Michael Di Venuto and (director of cricket) Alec Stewart will provide the platform to reach new levels with my batting. “It is a fantastic opportunity to join a young and exciting squad. I am very excited for the years ahead at the Kia Oval which is a great Test Match venue and I hope my experience can contribute to a period of success for Surrey CCC. 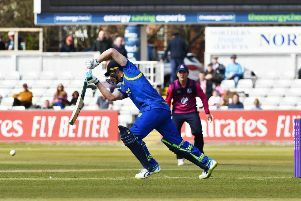 Stoneman has played more than 100 first-class matches for Durham since making his debut in 2007 and has been a reliable performer across all formats in recent years. The north-east county confirmed they had made an offer to keep the left-hander but he joins outgoing wicketkeeper-batsman Phil Mustard in ending his long association with the club at the end of the season.